Hours before a 72 hour strike notice was issued by SEIU Local 1021, ATU 1555, and AFSCME 3933, BART officials and union leaders held dueling news conferences to try to win the public’s support. The day started with Antonette Bryant, the president of Amalgamated Transit Union Local 1555, which represents 945 station agents, train operators and clerical workers, and other union leaders alleging at a morning news conference that BART management’s lead negotiator, Thomas Hock, has a history of engaging in hardball tactics and forcing strikes. Bryant accused Hock and BART of engaging in “surface bargaining,” which she said is a technique designed not to make progress. Bryant said, “We come to the table every day to bargain but we can’t bargain with ourselves,” alleging that BART management isn’t participating in a meaningful way. BART management spokespersons then held a midday news conference to say that although the transit agency’s employees deserve a raise, their new contract must address the escalating cost of their benefit packages. BART spokesman Jim Allison said the agency’s medical costs have grown 251 percent in 12 years and its pension costs have grown 126 percent in 10 years so it must begin to “normalize” employees’ benefits too so they’re closer to those earned by other public employees. BART must keep its costs under control because it will need to make $6 billion in improvements to keep its trains system safe and reliable, Allison said. Management met at the bargaining table at noon today with negotiators for ATU Local 1555 members and Service Employees International Union Local 1021, which represents 1,430 mechanics, custodians and clerical workers, but talks ended at about 4 p.m. because union members left to participate in a rally and march at Frank Ogawa Plaza in downtown Oakland that was scheduled to begin at 5 p.m.
At the morning news conference, Bryant said the unions’ felt justified in planning to leave the talks at 4 p.m. because management has left the bargaining table early at other sessions when the unions wanted to keep talking. Bryant said the purpose of the rally and march is to “unite riders and workers” and said union leaders would be available to resume negotiations tonight. However, BART spokesman Rick Rice said at 5 p.m. that he hadn’t heard of any plans to resume the talks tonight. But he said negotiating sessions are scheduled for each of the next three days. 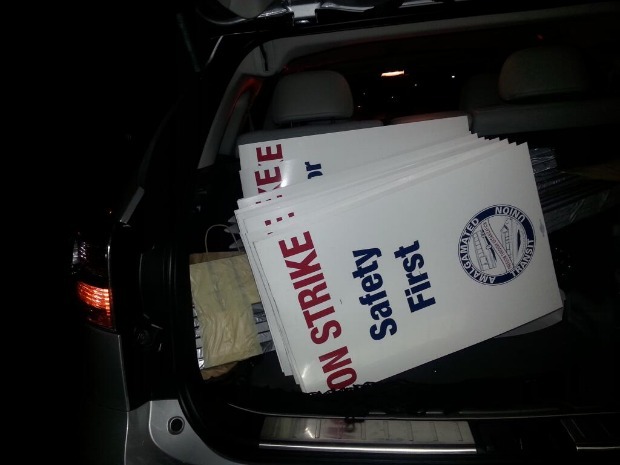 At 7:17 p.m., SEIU Local 1021, ATU 1555, and AFSCME 3933 officially notified BART that they may strike Sunday at midnight. “Despite attempts by the union to negotiate a solution to contract issues during a 30-day contract extension, BART management has barely come to the bargaining table and continues to refuse to negotiate in good faith or make any progress on critical safety and wage issues,” the unions said in a statement. Earlier today, Bryant said union leaders have reached tentative agreements on some minor issues in the contract talks but said the two sides still have a lot of work to do before they can reach agreements on the big issues in the talks, which are wages, pension contributions, health care contributions and worker safety. BART employees went on strike the morning of July 1 but late July 4 they agreed to extend their previous contract for 30 days, until Aug. 4, and return to work the afternoon of July 5. The four-and-a-day strike snarled local highways and caused commuting headaches for Bay Area residents, and regional transit officials fear another traffic nightmare if BART and its employees don’t reach an agreement by Sunday night. Jeff Shuttleworth of Bay City News contributed significantly to this report. Eve Batey is the editor and publisher of the San Francisco Appeal. She used to be the San Francisco Chronicle's Deputy Managing Editor for Online, and started at the Chronicle as their blogging and interactive editor. Before that, she was a co-founding writer and the lead editor of SFist. She's been in the city since 1997, presently living in the Outer Sunset with her husband, cat, and dog. You can reach Eve at eve@sfappeal.com.